Has it already been a year since I read about the 4th anniversary of the Mars rovers that just keep rolling along? And they're still rolling after five years of continuous work, on a cold, sandy planet 230 million kilometer away from Earth. For once, the word "awesome" is actually a good fit. If you ever wonder how far the human race has really come since our ancestors first began using tools, you should contemplate this fact for a while. It is absolutely mind-boggling. Wow! Black Mesa have released a trailer. I wasn't sure that they would ever complete their mission of recreating the original Half-Life game using the Source engine, but damn, this looks good! I have a huge backlog of pictures taken this summer, but at last I've found some time to go through them, and I've just finished with a batch from the last day I spent in London in June, after the Erlang eXchange event. The weather was glorious, and we spent most of the day walking along the Thames, with Francesco as our guide. The pictures are here on Flickr as usual. Since I do quite a lot of hobby hacking in my spare time, I've been thinking about setting up a personal server for things like version control and ticket tracking, etc. On the other hand, I don't really have a good place to keep an always-on computer in our modest apartment, what with noise, cables, cooling and such. I finally started looking around for a good hosted alternative, such as a virtual private server - but that seemed a bit like overkill for my present needs, and I'd have to set up everything myself from scratch. And sites like SourceForge and Google Code are not suitable for private projects. Eventually, I found a couple of sites such as hosted-projects.com and CVSDude, that seemed to be what I was looking for and had quite reasonable prices. In the end, I chose hosted-projects.com, because they included everything I needed (Subversion and Trac, https, and even DAV) even in the most basic plan - three Prosits for German pragmatism! I have already copied most of my various ToDo-notes from different sources such as e-mail, digital post-it notes, semi-legible scribblings on paper, etc., into proper Trac tickets (lots of them), and my home directory is version controlled so that it's pretty much identical both on Linux and under Cygwin. And of course, all my code, LaTeX articles, etc., is in there too. I usually avoid the worn-down expression "warm and fuzzy feeling", but for once, it really fits. A great day! Blue sky, glittering sea, a cool breeze through the treetops, and the distant cries of seagulls. 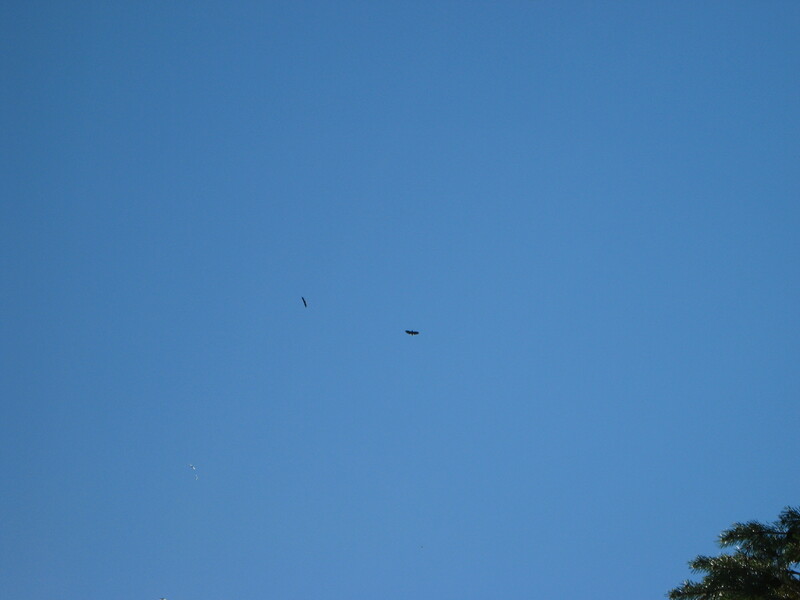 Around noon, two eagles showed up circling just above the house, which finally gave me reason to pick up the camera. Some more pictures on my Flickr page. Yay! Thanks to this page, I managed to get a working GPRS connection under Linux (Ubuntu Hardy Heron). The only thing I had to change was to delete the line OK 'AT+CGDCONT=2,"IP","btmobile.bt.com"' from the /etc/chatscripts/bluetoothconn script. Also, the script /etc/init.d/bluez-utils was in fact named /etc/init.d/bluetooth. And the blues-pin package was apparently not needed (I couldn't find it anyway). This all means that I: 1) had something to write about in this new blog of mine, and 2) I'm writing from the middle of nowhere, but it actually works, and is even not too painfully slow. Hooray! I should probably post something here to get it over with. There, done! That wasn't so hard. I'll get back with something more useful later.